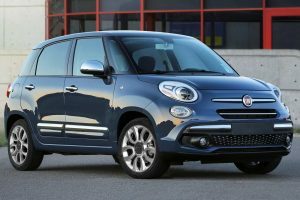 Windsor, Ontario: The Fiat brand announced recently the return of the popular Urbana Edition for the Fiat 500L with new standard features for 2019 that add further customization choices and style on top of contemporary Italian design. Adding a custom and unique look to 2019 Fiat 500L Trekking models, the Urbana Edition includes unique exterior features including standard 17-inch gloss black aluminum wheels, black roof plus Miron-black accents on door handles, body-side moldings, fog lamps, side mirrors and fascias. Five exterior paint colours are available with the 2019 Fiat 500L Urbana Edition: Black, Bronzo Metallizato (bronze), Bianco (white), Grigio Scuro (gray) and Verde Bosco (green). A standard contrasting black roof further complements its distinctive Italian colour palette. Interior touches further highlight a custom appearance with eye-catching features including black leather seats with copper stitching plus a unique dashboard with an ingrained copper 500 logo that ups the ante in the fun-to-drive environment. With a starting Canadian MRSP of $27,995 for Trekking models, the 500L Urbana Edition is available for an additional $595 MSRP. Building on the style, efficiency and driving enjoyment that has made the Fiat 500 an icon, the 2019 Fiat 500L expands the Cinquecento’s appeal by offering 42 per cent extra interior space with comfortable seating for five in three models – Sport, Trekking and Lounge, engaging driving dynamics and a 160-horsepower 1.4-litre MultiAir Turbo engine, all wrapped in contemporary Italian design. Head-turning Italian design and the ultimate fun-to-drive factor come standard with every FIAT. That philosophy is embodied by the iconic Fiat 500 or Cinquecento – a small car that lives big. Born in Italy and rooted in a rich heritage, the 500 is sold in more than 100 countries. In North America, the Fiat 500 was introduced in March 2011 and was soon followed by the Fiat 500c (Cabrio), the high-performance Fiat 500 Abarth and Abarth Cabrio, the five-passenger Fiat 500L, and the all-wheel-drive Fiat 500X crossover The Fiat 500L Urbana Edition arrives in FIAT studios this spring.